In May, electric cooperatives across the country promote safety awareness to coincide with National Electrical Safety Month. Every year, thousands of accidents occur due to shock hazards. Wasco Electric, a not-for-profit electric utility, is committed to educating the public about potential electrical dangers in the home. In 2016, 475,500 structure fires—including residential fires—were reported in the U.S., causing 2,950 deaths, 12,775 injuries and $7.9 billion in property damage. According to the National Fire Protection Association, a residential fire was reported every 90 seconds. Many home fires occur when electrical equipment is outdated or improperly used. It is critical that people understand their home’s electrical system and the safety concerns associated with the latest residential technologies before bringing them into their homes. With newer technologies, such as solar panels, electric vehicles and more electrical gadgets in the home, people need to ensure they have an electrical system that’s compatible with the increased load. Through electrical safety awareness and education, we can all play a part in preventing electrical hazards and injuries in the future. 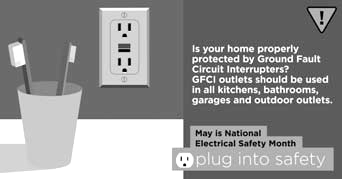 Together, let’s plug into safety this May. Cover image: electical outlet by grendelkhan on Flickr.